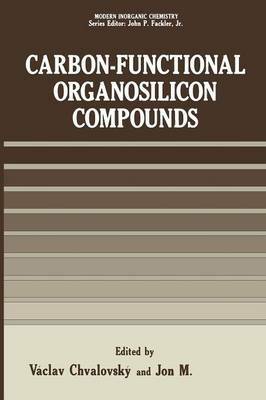 The term "carbon-functional organosilicon compound" is used for organosilicon compounds in which a functional group is bonded to an organic moiety that is in turn con- nected to silicon via a Si-C bond. Thus, only Si-Cn-Y com- pounds (Y designates a functional group) will be discussed in this book 1 Si-O-Cn-Y compounds will in general not be considered, although the latter group does include a large number of natural substances containing silylated hydroxyl groups. (Because of the differing importance of various Y groups, the reader will find some deviation from this restriction). Finally, compounds containing a silyl group as the functional group are not considered. An overview of the field of organosilicon chemistry would show that in the last several decades the commercial synthesis of organosilicon products has increased substan- tially, both in annual production and also in the increasing variety of compounds produced. This increase in the number of commercially available carbon-functional monomers and polymers (silicone polymers) is most remarkable and is occurring because new applications are continually being found for these compounds. As might be expected, the number of publications in this field is also increasing. The important position of silicon in the periodic table - between carbon, aluminum, and phosphorus - means that an understanding of the nature of the bonds in organosilicon compounds is quite important in order to understand the bonding in these other areas.